Pahlish Harry Potter Collection, November Duo, and Gift with Purchase polish swatches and Review! Hi there everyone! I have a huge post for you all today. Pahlish is releasing 17 polishes for Black Friday until 11:59 PM on Monday night. I would’ve gotten my post up sooner, but my camera broke the other day in between swatching these gorgeous polishes. All of these will be preorder style, and two of the polishes are Gift with Purchase polishes. Let’s dive on into the pictures! The Leaky Cauldron is described as a raisin cream. I used two coats for this beauty! 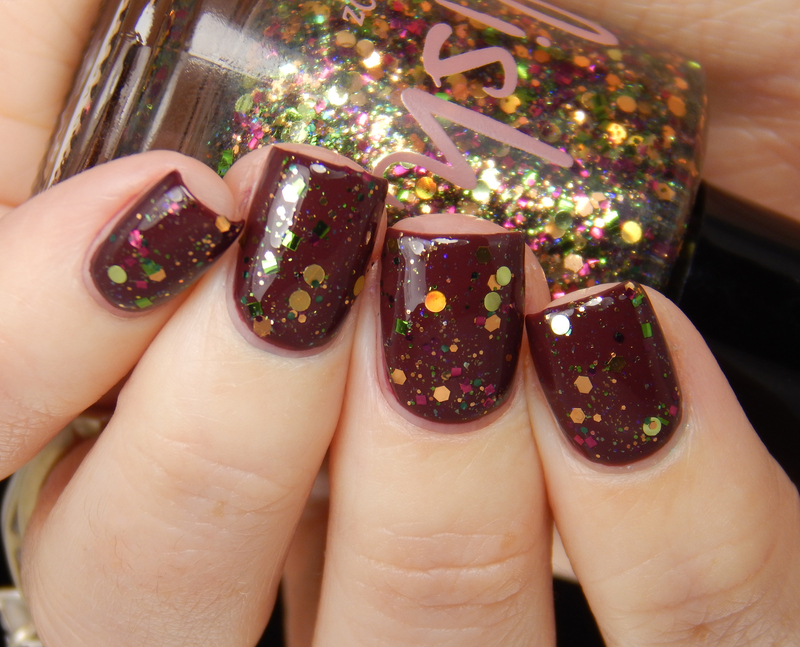 Gringott’s is described as a topcoat with a mix of glitters in berry, wine, copper, and olive green with green/purple shimmer and gold/melon dots. I used one coat over Leaky Cauldron. Next up we have the Deathly Hallows Trio! Elder Wand is described as a dark brown jelly with bright blue shimmer. Super stunning! I used 3 coats for opacity. Invisibility Cloak is described as a soft lavender-silver holographic with holographic flakes, platinum shimmer, and purple flakes. I LOVE this shade guys, it’s stunning! I used two coats for the pictures. Resurrection Stone is described as a sheer black jelly with teal to pink duochrome shimmer. I LOVE this shade too! I used two thick coats for these swatches. Next up is The Sorting Hat collection. This consists of four polishes. 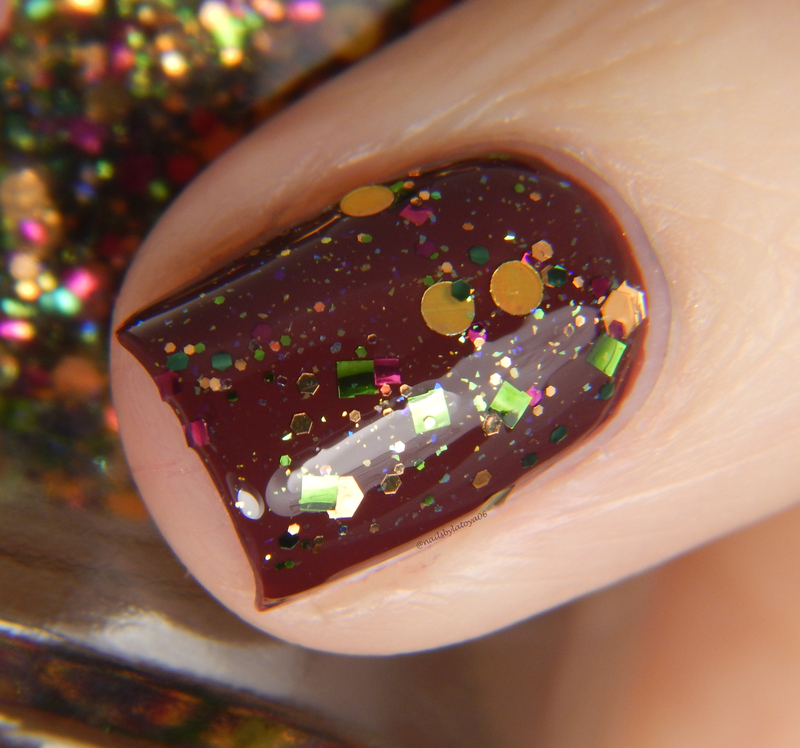 Gryffindor is described as a scarlet red jelly with a mix of gold and rose gold flakes. Another favorite of mine! This is two coats. Slytherin is described as an emerald green jelly with a mix of platinum and silver holographic flakes. Such a pretty green! This is two coats shown. Ravenclaw is described as a deep indigo blue jelly with gold and bronze flakes. So much depth! I used two thick coats for the pictures down below. Hufflepuff is described as a bright marigold yellow jelly with a mix of charcoal and ultrachrome flakes. Such a pretty and cheery shade! Look at those flakies. I used three coats for the photos below. Next up we have the Fantastic Beasts trio! Hungarian Horntail is described as a scarlet red pearl. Two coats shown below. Short-snout is described as a indigo blue cream with red pearl shimmer. Two coats shown below! Opal Eye is described as a soft lilac cream with subtle violet pearl shimmer. I used three coats for the photos below! Now we’re onto the Wizarding World bespoke batches! Weasley’s Wizard Wheezes is described as a bright coral-pink holographic with metallic red shimmer. This is my favorite color out of the whole collection!!! Two coats shown for the pictures below. 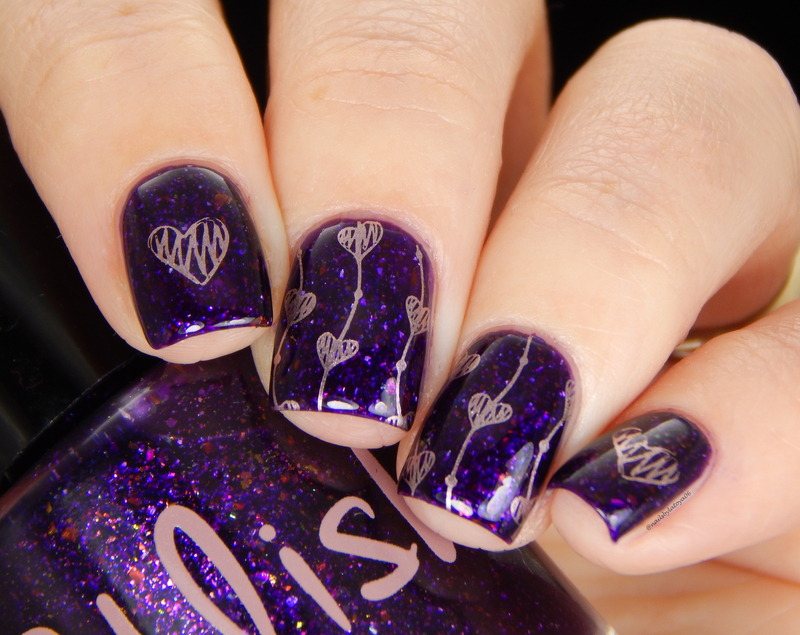 Lestrange is described as a dark plum linear holographic with blue shimmer. Two coats shown below! Wingardium Leviosa is described as a bright blue holographic. So stunning! I used two coats shown below. And last but not least we have the Gift with Purchase polishes! Dumbledore’s Army is described as a turquoise jelly with holographic flakes and blue ultrachrome flakes – free with $50 purchase! I done two coats for the pictures below! And, The Boy who Lived is described as a purple jelly with a mix of ultrachrome flakes and holographic flakes – free with $75 purchase. I used two coats for the pictures below! Don’t forget that these polishes release at 12:01 CST on Black Friday and ends Monday at 11:59 PM. Dumbledore’s Army is free with orders $50+ and The Boy who Lived is free with orders $75+. 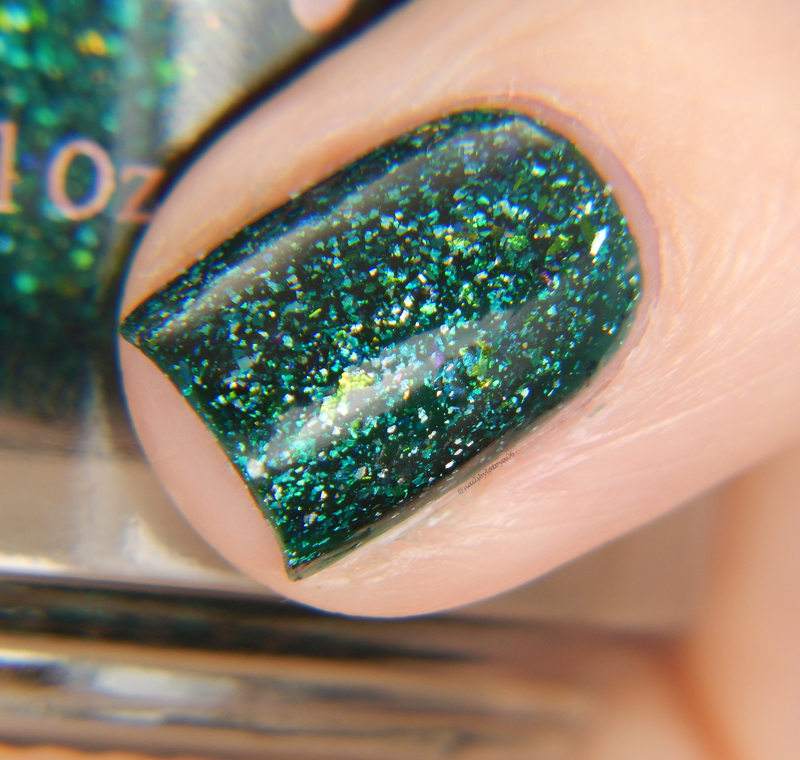 There will be discounts all in the shop so you can stock up on some polishes that you may have missed out on. Be sure to check out Pahlishes shop and their Facebook page to stay up to date on releases and sales! Thanks for reading today and I’ll talk to you all soon!!! 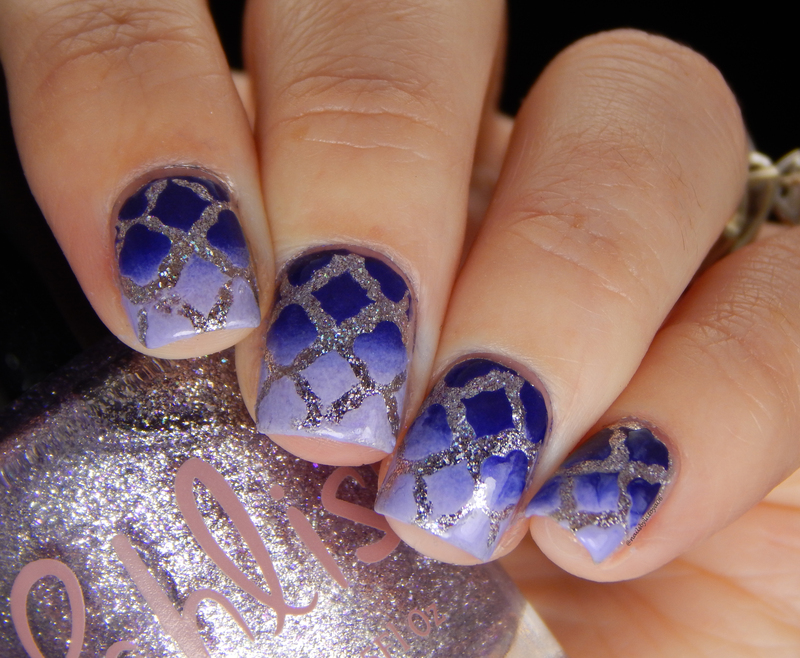 ← Winter manicure featuring ILNP Industrial Park! This is insane. 😍 I want them all! Amazing! Such a brilliant idea!